Make 6 evenly spaced deep slits in beef roast, using sharp knife. Insert garlic clove into each slit. Sprinkle pepper evenly over entire roast; rub pepper into roast. Spray inside of 3- to 4-quart slow cooker with cooking spray. Place onion slices in cooker; pour broth over onion. Add beef. Remove beef from cooker; place on cutting board. Cut beef across grain into thin slices. Return beef to cooker to moisten. 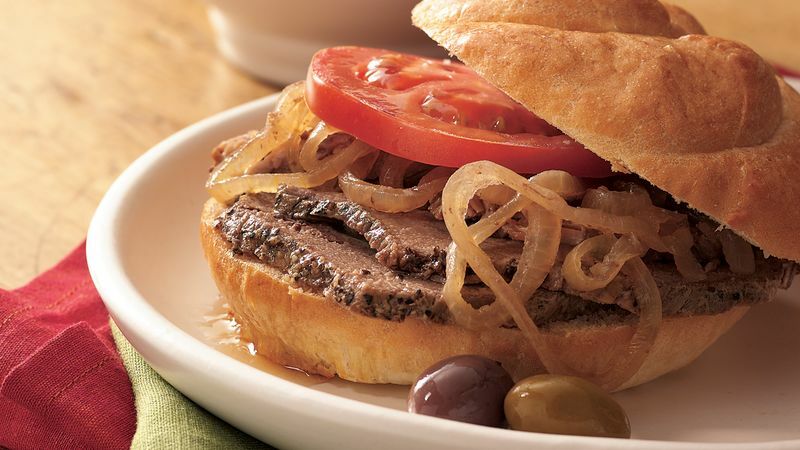 To serve, fill each toasted roll with beef, onion and 1 tomato slice. Spoon small amount of broth from cooker over beef if desired.